DSM-5® Clinical Cases presents patient cases that exemplify the mental disorders categorized in the newly released DSM-5®, bringing DSM-5® alive for teachers and students of psychiatry, psychology, social work, nursing, and related mental health and healthcare fields. Cases are cross-referenced with DSM-5® and help the reader understand diagnostic concepts, including symptoms, severity, comorbidities, age of onset and development, dimensionality across disorders, and gender and cultural implications. 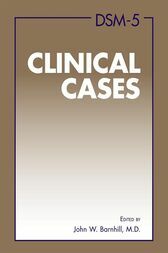 All cases are original and previously unpublished, making for fresh, compelling reading for both experienced clinicians and those new to diagnostic classification. Case authors were selected for their expertise in the disorder described in the case. For ease in identifying specific cases, case titles are clinically relevant, based on the primary complaint, and identify the DSM-5® diagnosis described. Each case adheres to a consistent format developed by the editors to fully illuminate the disorder being profiled. Features may include history of present illness, family psychiatric history, medical history, mental status exam results, DSM-5® diagnostic features, lab and physical findings, and a summary. A brief discussion follows each case, analyzing the clinical presentation, highlighting key points, and exploring issues of comorbidity that may complicate both the diagnosis and subsequent treatment. This approach is especially helpful since few cases in real-life are unambiguous. Easy-to-use appendixes enable readers to locate cases by type of disorder, special interests, and DSM-5® diagnosis. The book is designed to serve as a companion text in a variety of contexts -- from abnormal psychology courses to medical school and residency training programs. In addition, those studying for specialty examinations will find reviewing the cases very useful. Fascinating, practical, and instructive, DSM-5® Clinical Cases succeeds in bringing the DSM-5® to the examining room. John W. Barnhill, M.D., is DeWitt Wallace Senior Scholar and Professor of Clinical Psychiatry and Public Health at Weill Cornell Medical College; Chief of the Consultation-Liaison Service at New York-Presbyterian Hospital/Weill Cornell Medical Center; and a faculty member at the Columbia University Center for Psychoanalytic Training & Research in New York City.